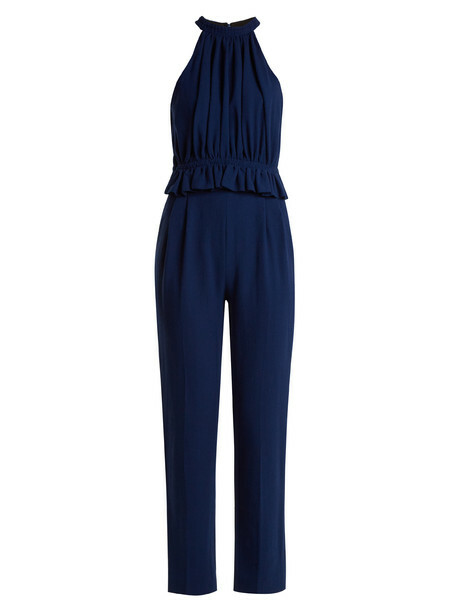 Emilia Wickstead's unerring attention to detail is executed to perfection in this admiral-blue Everette jumpsuit. Crafted from wool-crepe it's deftly gathered at the neckline and fluted waist and falls into straight legs that are streamlined with front pleats. The trail of rouleau buttons at the back are a refined hint at the designer's pristine ladylike aesthetic. Wear it after dark with blush-pink accessories - heeled mules are a particularly modern choice.